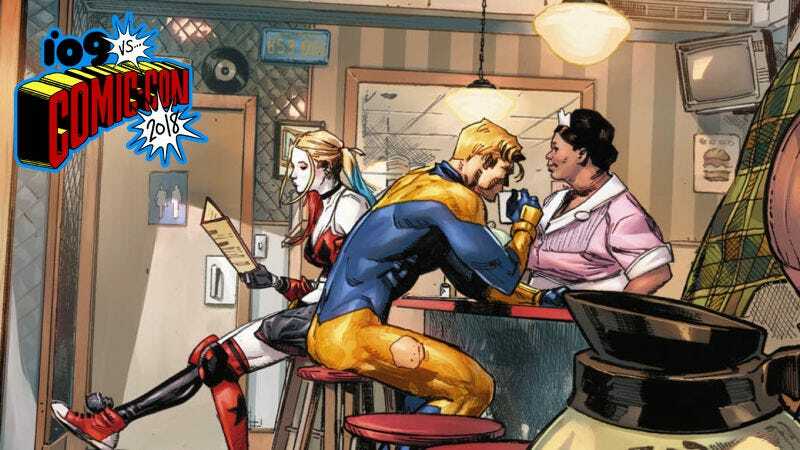 Harley Quinn and Booster Gold in Heroes in Crisis. It’s impossible to listen to writer Tom King talk about DC Comics’ upcoming Heroes in Crisis series without gaining a new appreciation for the larger narrative project he’s been crafting across other comics, like Mister Miracle and Batman. King has brought an existential melancholy to the fore in characters like Booster Gold and Mister Miracle that’s changed the temperature of DC’s books. Booster, the consummate jovial screwup, has been shaken by his most recent adventures through time and space in ways that have left the usually upbeat hero broken and not quite himself. Scott Free’s grip on reality has steadily weakened as he’s been pulled black into the orbit of Apokolips, its never-ending wars, and his dysfunctional family. Even characters like Poison Ivy have struggled with devastating mental breakdowns that put the lives of billions in danger—and to King, there’s a thread connecting each of these stories together. Even though many of them are larger than life characters who defy the ideas of what regular humans can do, many of DC’s heroes and villains are suffering and struggling with the trauma that comes along with the kinds of lives they lead. Recalling his time as a counterterrorism officer, King explained that even on days when he knew for a fact the work he’d done had saved lives, knowing there was at least one person lost still devastated him. In many ways, Heroes in Crisis is a story about how superheroes are forced to deal with that feeling all the time. Harley Quinn in Heroes in Crisis. “For the last two years I’ve spent my life trying to put myself back together and trying to see what that was about. Was it childhood stuff? Was it being in the war? What sort of moment of violence or discontinuity cracked me? That process has been revelatory. This idea—that confronting one’s weaknesses and fears can be a transformative and vital part of overcoming psychological trauma—is one of the major cornerstones of Heroes in Crisis, which prominently features Sanctuary, a rehabilitation center for heroes and villains who find themselves in need of help. King described Sanctuary as being the encapsulation of all the work Wonder Woman, Batman, and Superman have done to make the world a better place and the achievement they’re perhaps most proud of. As Heroes in Crisis opens, the center is a place we see other characters coming to—but King explained that, to him, Sanctuary isn’t exactly a new idea that he’s introducing into DC’s universe. Instead, it’s a logical extension of something that the Trinity have always needed to be strong: help. At the center (located somewhere in Nebraska), heroes and villains are welcomed and offered the chance to anonymously undergo a kind of intense therapy that’s designed to help them confront the emotional demons haunting them. Rather than employing real people who might harbor biases against guests, Sanctuary is staffed by an advanced artificial intelligence modeled after Wonder Woman (for her compassion) and built by Batman using Kryptonian technology. The guides bring guests on a journey of sorts that’s designed to help them best grapple with whatever it is that’s troubling them, be it a recent attempt to take over the world or the loss of a family member. Harley finding Booster in a diner. Guests are able to experience their tailor-made therapy sessions in holodeck-like chambers that create whatever situation they need in that particular moment. For some, that means climbing a mountain or laying on a beach, but for others, like Bruce Wayne, it can mean having the chance to spend time with his protégés as children again. At the end of their stay, guests are encouraged to make peace with and embrace the dark things that brought them to Sanctuary and, should they choose to do so, reveal who they are. That all being said, this is a Tom King story, so of course things go terribly, terribly wrong. “We’re going to do deep dives into the emotions of these characters and get into their lives in ways you’ve never seen in comics before, the way we did with Mister Miracle. King said that the massacre at Sanctuary is a reflection on the gun-related deaths he once saw overseas during the war that he never imagined seeing here in the U.S. But mass shootings are all too common and King wanted to bring that specific sense of horror to Heroes in Crisis. “Batman says something that still haunts me. It haunts all of them, too. ‘What’s happened is what always happens: Our attempt for redemption has turned into another quest for vengeance.’ So we start with this mystery: Who did this and why? As fantastic as it’s been to see Mister Miracle cast in a new, more nuanced light under King’s watch, it’s going to be interesting to see what King does with some of DC’s more prominent characters in the coming months. DC’s most famous heroes have always been more mythological and grandiose compared to other publishers, but when Heroes in Crisis #1 drops on September 26, we’re going to see them at their most human and vulnerable.